Just as we promised, the XinaBox and Zerynth partnership is bringing more exciting opportunities for IoT development. 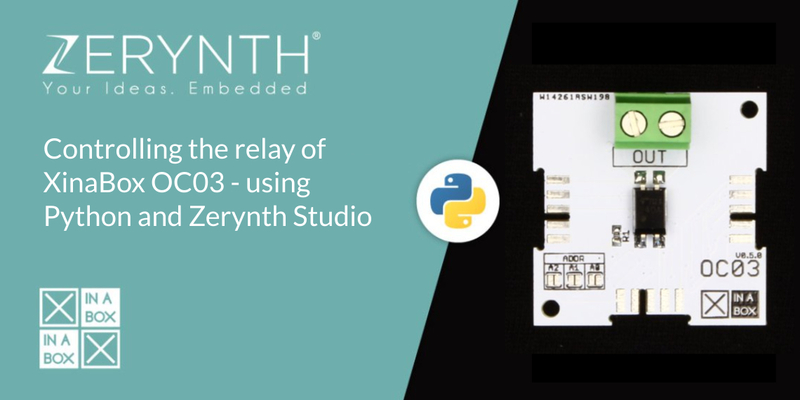 After the Zerynth programmable XK12 IoT Starter Kit and we started things off with a simple LED blinking tutorial, and now we are about to bring things to another level with a new post about controlling the XinaBox OC03 relay module with Zerynth Studio. The OC03 is a low-voltage control relay module able to switch AC and DC loads. The optically isolated relay is controlled by a PCA9554A IO expander, which provides a control interface to the switch. The PCA9554A has several selectable I2C addresses accessible via solder pads. The TLP241A photo-relay consist of a photo MOSFET optically coupled to an infrared light emitting diode which switches an AC or DC load. It provides an isolation voltage of 5000 Vrms, making it suitable for applications that require reinforced circuit insulation, as you can see in the documentation. Assemble the CW02 xChip, based on ESP32 by Espressif Systems, with the IP01 module (USB Programming Interface) and with OC03. More info here. You can start with our code examples, that you can “clone” in just a few seconds. Follow this link to find more information about code examples for the OC03. The one featured here is a simple example to toggle the relay on OC03 and return the relay state. Now all you are left to do is to verify and uplink the script into the device. First, click on the Verify icon (the button on the upper left toolbar), and your script will be checked for errors. If there are any, they will be neatly reported in the console and in the code editor. All you are left to do now is download Zerynth Studio and start your own project. Don’t forget that it’s free and available for Windows, Linux, and Mac OS.